Obituary – Rupp, Norma Jean (VanBebber) « Perry High School Alumni Association, Inc.
Red Hots 49-50, D.E. 51-52. ﻿Norma Jeanne Rupp, 58, Norfolk, Neb., formerly of the local area, died Sunday at Norfolk of complications from cancer. Memorial services are being planned at Norfolk. Burial will follow at Grace Hill cemetery at Perry. Mrs. Rupp was born Feb. 5, 1933, in the Watchhorn community, north of Morrison. She was the daughter of Ralph and Helen VanBebber. 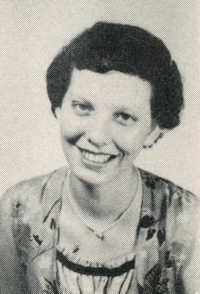 She was a graduate of Perry high school and married Melvern Samuel Rupp of the Sumner community on May 28, 1953, at Perry. She had lived in Washington and Iowa in addition to the local communities and in Nebraska. Survivors include two sons, Craig Rupp, Norfolk, and Scott Rupp, St. Paul, Minn.; two daughters, Cindy Rupp, Tulsa, and Marla Rupp, a senior at Oklahoma State university at Stillwater; seven grandchildren and one sister, Joan Bamberger, Reno, Nev.
Mrs. Rupp was preceded in death by her parents.